There was a cool bite to the air when I walked through Prospect Park on my way to the farmer's market yesterday. The bronze afternoon sunlight fell at a slanted angle, an implication of early darkness. Bright sugar pumpkins and a collection of gnarly gourds were scattered amongst the market's booths of apples and pears, beets and squash. People were wearing scarves and sipping steaming cups of hot cider. It snuck up on me, but, apparently, it's fall. There were moments this summer, as I stewed in the claustrophobic heat of my top-floor, un-air-conditioned apartment, when I was positive that fall would never come. I was destined to roast myself into sweaty oblivion forever. How lucky that things change. Sweaters have come out, blankets piled back onto my bed, clunking acorns drop constantly on my fire escape. And it is time to start bringing cold weather cooking back into my repertoire. Last night, snug in my friend John’s beautiful kitchen, we concocted a magnificent osso buco. The rustic braised veal stew – meltingly tender and full of flavor, topped with a parsley pine-nut gremolata, side-by-side with the traditional Italian accompaniment of a creamy risotto – was the perfect way to inaugurate fall. Inspired by Mario Batali, the recipe was surprisingly easy. A hefty tomato sauce simmered on the stove as we chopped the onions, carrots, celery and fresh thyme. 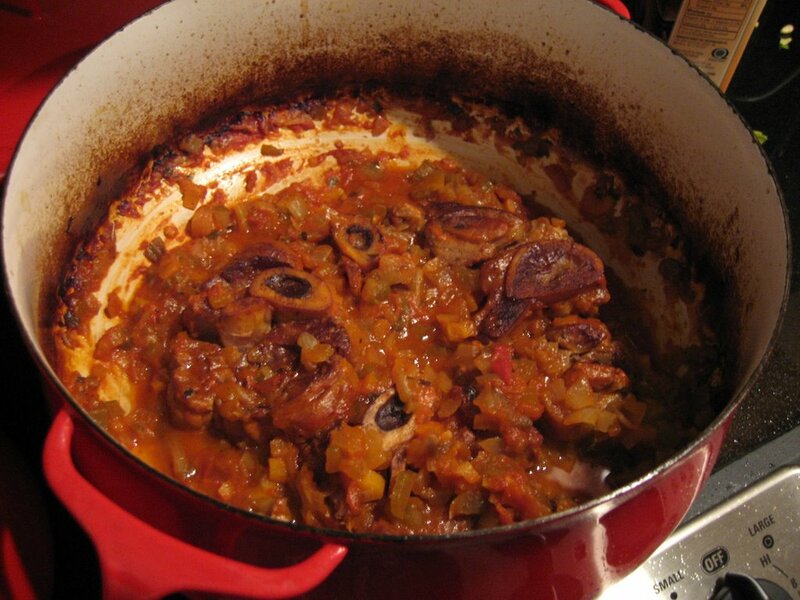 The veal shanks plopped in a hot pan of olive oil to brown with a dramatic sizzle. Within thirty minutes the osso buco was in the oven, left alone for two and half fragrant hours. John and I just had to sit back and wait. We watched a movie (something violent with John Cusack, of which I was not a fan), sipped some wine (left over from the cooking), pondered the pros and cons of Leonardo DiCaprio (shockingly good in The Departed, I thought) and the merits and pitfalls of grad-school (is it worth it?). I eventually removed myself from the couch to stir a leisurely pot of risotto. John’s skills as a Cuisinart master were proven solid when he pulsed together the gremolata garnish. And when I lugged the big pot out of the oven and opened the lid, I was surprised at the ease with which it all came together. (See -- don't I look about to be surprised in that photo?) It is very satisfying to make such a great meal with so little trouble. The meat was falling off the bone, a beautiful braise. The risotto was just a bit al dente, the perfect textural foil to the stew. The pine nuts in the gremolata were a necessary crunch; the green of the parsley and yellow of the lemon zest rounded out the color palette. Fall is coming along quite nicely. 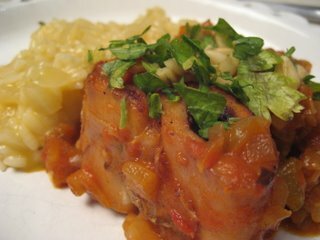 -season osso buco with salt and pepper on both sides. -in a large dutch oven, brown the osso buco in olive oil (the oil should be hot to the point of smoking), on all sides, about 12-15 minutes, and then remove from the pan. -add carrot, onion, celery, and thyme to the pot and stir for about 10 minutes, until the vegetables are softened. -add tomato sauce, stock and wine. bring to boil and then place the osso buco back in the pot. -make gremolata: mix parsley, pine nuts and lemon zest. 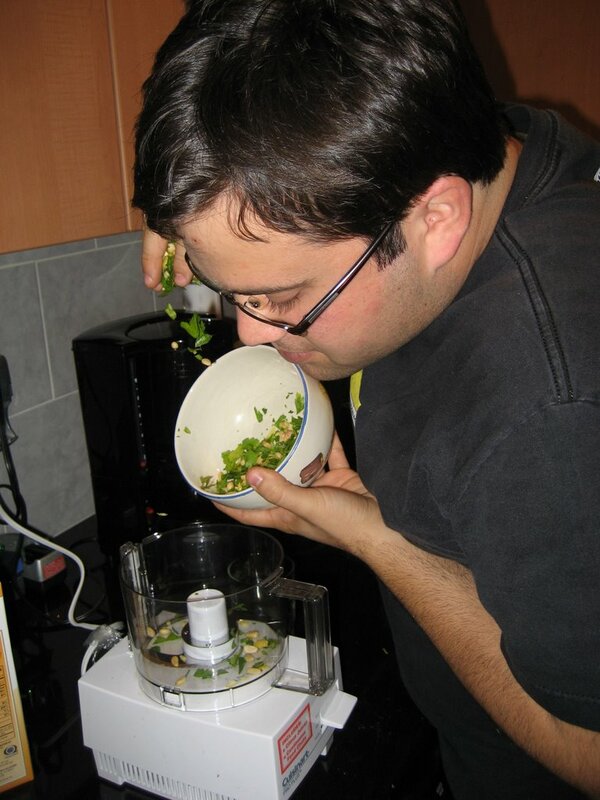 give it a few pulses in food processor. sprinkle on top of the osso buco when serving. -heat olive oil, add onion and garlic and cook, stirring, for 8-10 minutes. add thyme and carrot, cook five minutes. -add tomatoes and bring to a boil. stir often. lower heat and simmer until thick, around 30 minutes. On Saturday night of last week I stood over a large metal pot on the stove, steam fogging my glasses, stirring a bubbling cauldron of soup with a wooden spoon. I was wearing baggy sweatpants and an old T-shirt of my brothers, my hair in a frizzy knot on top of my head. The sound of the Gypsy Kings danced in the background of my apartment. For the first time in what felt like a long time, I was staying in for an evening, by myself. I had switched off both my cell phone and computer. I finally had a moment for the kitchen. Life has been piling up on me the last few weeks and in my much-needed evening of solitude, I was on a mission for comfort. And so I was concocting a simple chickpea-tomato soup – its muted red color was made vibrant by a hefty flavor. The methodical act of chopping the requisite knotty cloves of garlic and sprigs of fresh rosemary released strong scents, a (relatively new) olfactory pleasure that never fails to lift my mood. There is something very healing about the act of cooking alone, just for myself. The mechanics of stirring and chopping, listening to the crackle of onions in a pan, the sensation of steam on my skin are soothing. The time spent alone, concentrating on the stove and the sink, the washing of vegetables and the slow crank of the can opener clears my head. And in the end when I sat with a good book, a glass of wine, and the quiet lilt of Bach, the warming soup with a hunk of fresh sourdough bread from the farmers market was just what I needed to feel like myself again. My mind has been in somewhat of a haze in the past month with reverberations of my accident’s anniversary, ending romances, the unexpected death of a friend. And, as a result, I have not felt inspired to write. Even sitting down at my computer today I spent a long time staring blankly at my keyboard, not sure what, if anything, I wanted to write about. I certainly haven’t been cooking; that soup was my first foray into the kitchen in weeks. The act of going out to eat has been more of a tool for distraction, time spent with friends. But of course, that is sometimes the most meaningful. Becca was in New York, unexpectedly, and on a Sunday afternoon we sat in a little French café just a few blocks from my apartment in Park Slope. The end-of-summer light was bright, streaming in the large front window and illuminating our glasses of water on the table. There was a young couple to our left, dressed in stylishly mismatched clothing and chatting with the chef who was obviously a friend. The woman behind the counter drank coffee from a big white mug; flaky brown croissants winked at us from behind the glass. We had spent the morning walking through the nether-regions of Prospect Park and were tired, hungry, in need of caffeine. The day before had been emotionally draining, spent at a funeral in New Jersey. It was difficult to put together any coherent words to express how we were feeling. But we sat and ate warm pressed sandwiches with fresh ricotta, oven roasted tomatoes and basil pesto; side-by-side with small, nutty arugula salads. It was comforting to be there, eating together. 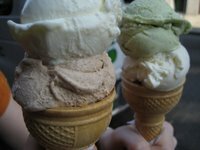 We later found ourselves in Manhattan and stumbled onto the magnificent Il Laboratorio del Gelato, a small and eclectic ice cream shop on the Lower East Side. We munched on cones of buttermilk, cinnamon, sour cream and fresh mint ice cream. We enthusiastically pondered the existence of such delicious, unusual flavors as we wandered through a wild little pickle festival on Orchard Street, packed with people and uniquely brined things. Our day of culinary distraction was a welcome, rejuvenating respite from all else. Jon and I, too, have been spanning the boroughs on gourmet expeditions – to a pig roast on the sidewalk in front of Il Buco, fried plantains and empanadas at the Caracas Arepas Bar, spicy pasta puttanesca at a hold-in-the-wall Italian restaurant, quail and coconut pudding at a Brazilian restaurant in Queens. The barbecued chicken and grits in our own neighborhood’s Sadie Mae's was a lengthy and mediocre taste-experience that I would probably not subject myself to again – but the pumpkin ale we brought there from the bodega on the corner was excellent. 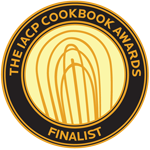 The culinary is, obviously, one of my favorite ways to deal with difficult times – but the most meaningful, comforting moment I have had recently involved nothing gourmet. It happened after seven of my college friends and I stood side-by-side, next to an open grave on a beautiful early-fall morning. It was brisk and sunny; white and red flowers peppered the vibrant green grass in the cemetery surrounding us. The sound of spoken Spanish hardly registered as we listened to the priest; there was only the universal muffle of crying. The red carnation in my hand was cold; the creaking squeal of the coffin as it was lowered into the ground echoed in my fingertips. The eight of us had met our first week of college; the ninth member of that little family was no longer with us. An hour later we stood together in the wide parking lot of a New Jersey strip mall. The men were in suits, their ties just beginning to loosen around their necks. Becca and I, the only women, were in stark, dark-colored dresses. Many of us had parted ways in the last few years; it was the first time we had all been together in a long time. And we stood together in our fancy, black clothing in a throng of people – men in flip-flops, women in ripped jeans, families with screaming children, gray-haired couples with matching canes – and waited for our names to be called over the loudspeaker. We were waiting for a table at Ihop, The International House of Pancakes. A favorite destination of our friend; we were there together to remember him. We all squeezed into a booth in the back of the crowded diner and ate soggy pancakes, wilting bacon and coffee poured out of a plastic thermos. I could feel the warmth of the shoulders next to me, the taste of orange juice in my mouth, the slow laughter of my friends as we caught up on days past. And I was struck by the inexplicable fact that we were there, together, and alive. There was something so gut-wrenchingly moving about feeding ourselves together that day. It was the sustenance of companionship and food, together in remembrance of a friend.